Boeing flew its prototype 767 Air Force tanker Tuesday with nonfunctional refueling boom and wing pods, concluding initial airworthiness testing. Boeing concluded the first phase of airworthiness testing of its 767 tanker prototype Tuesday. This time the plane even looked like a real tanker, though it isn’t quite there yet. This first prototype plane is testing the airframe and how it flies. 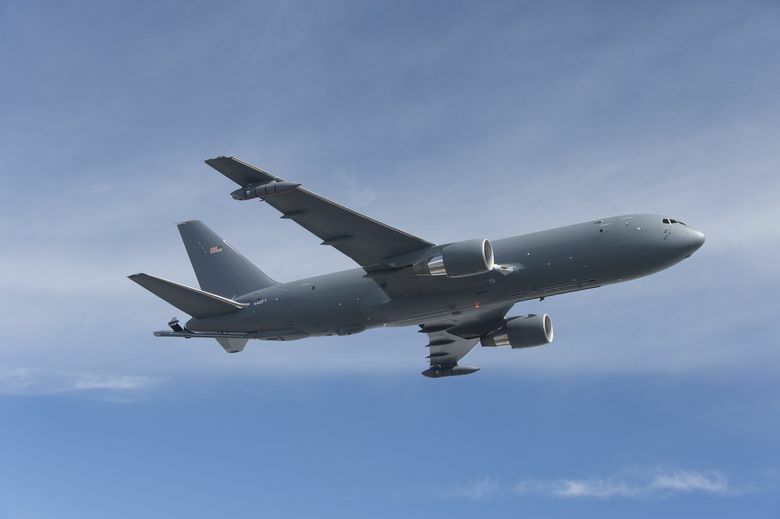 The second test plane, which will be a real KC-46 tanker outfitted with working aerial-refueling systems, is to fly in summer. On Tuesday’s flight, the prototype for the first time carried a refueling boom, a rigid tube extended back from the plane’s underside that’s used to pass fuel to an aircraft flying behind and below the tanker. The prototype was also fitted with wing-refueling pods, which are used to refuel aircraft with different in-flight fuel-docking systems that fly behind and to the side of the tanker. This equipment was not wired up and was not functional. However, the flight provided data on how these external attachments affect the jet’s behavior. After the prototype’s maiden flight in December, Boeing worked on the plane for five full months before it flew again. Then it flew three test flights on successive days last week. Tuesday’s flight lasted 4.3 hours and went well, said tanker spokesman Chick Ramey. Boeing has a contract to deliver to the Air Force the first 18 operational tankers in 2017. The Air Force plans to buy a total 179 tankers under a $49 billion contract. This first test plane will now enter planned ground testing, including Federal Aviation Administration (FAA) certification testing of the fuel systems. After that, it will return to the air for the next phase of airworthiness testing, which will push the limits of speed and altitude and support follow-on testing. The final two test airplanes in the flight-test program are expected to fly by the end of the year, Ramey said.